The warmer weather has arrived very late this year, and consequently all of my training runs seem to have been in snow, hail, rain, wind and if I was lucky, just overcast! The start of my ‘ultra’ week began with 3 solid days of rain, but by Sunday the climate had finally shifted to normal if not warmer conditions. This meant my first long run in 18°C sunshine, and by long I mean my longest ever run – 35 miles of off road countryside for the “Shires & Spires” Northants Ultra 35. I originally decided to run an ultra after feeling like I could have run further when I finished my first marathon last year. Thoughts of running a 50k soon after were put on hold with the amount of training time I had already consumed. But several months later when I saw there was an ultra practically on my doorstep I had to put the ultra bug to bed! Training officially started in mid December, when I broke the schedule up into three chunks; a marathon in March, another four weeks later and the ultra five weeks after that. It was the only way I could get my head around training for 35 miles. Although I felt in good shape in December, I had an unfortunate (read stupid!) incident involving my soles and 13 miles of frost, resulting in major blisters. Two weeks out was a lucky escape and I found I could run (in shoes) once the blister fluid had been re-absorbed. I took the risky approach of ramping up my mileage quite sharply to get me back on track, which mostly paid off. I did suffer a calf strain after a fartlek session one evening in February, missing a mid week 9 mile run, but was able to drop my pace and got 16.5 miles out of the 20 mile weekend long run done in 4mm xero shoes. At this point I was taking part in a barefoot running study so was keen not to miss any runs through injury. Fortunately this was the only one! The first marathon was tough, but provided some valuable lessons about nutrition and terrain pacing. The second marathon was comfortable up to 21 miles and although it was a training run I wanted to PB. Without gels this wasn’t going to happen though, and I promptly moved on to some ultra marathon specific training. For me this involved running to heart rate, something I had never tried before. Being tired, it was great having a valid excuse to slow down or walk when my bpm started to rise. I quickly established 150 bpm as the point to slow on the flats and 155 bpm as a cue to walk the hills. On my final 24 mile long run on the actual ultra course I adhered to this rule, and managed a sub 10 min / mile pace without gels and included three decent hills. Over the final three weekends I ran the entire ultra course, which eased any anxiety over navigation, terrain and footwear. The race started and finished at the impressive Lamport Hall. I felt strangely calm standing on the start line at 8:30 with the other 116 runners. I had every intention to enjoy the entire race, with no unrealistic time goals or wish to go into a zombie state for the final 9 miles of unknown. My gut feeling several months ago was a 6 hour finish (10 min / mile) but having run the course I thought 6 1/2 to 7 hours was more realistic. Once we got started and the atmosphere and temperature pushed my heart rate zones up by 10 bpm I was prepared for a 7+ hour finishing time! The first 4 miles were offroad and flew by, and we reached the first check point (Cottesbrook) and I refilled my bottle. I had brief conversation about suitable footwear with the marshalls as I was in my tatty fivefinger bikilas and one had been asked if trail shoes were required, and another had tried some barefoot running on grass. Once done though, I whipped off my shoes and continued barefoot myself! 2 1/2 miles, one big hill and a chat with a running club member/spectator later at Hazelbech, and I put my shoes back on as I knew the road was rough having run it barefoot on a training run. I seemed to lose the group of runners around me for a few miles at this point, but it gave me a chance to relax and get my head ready for the many miles ahead. It was here I realised I would struggle to eat the fig rolls I was carrying and had used throughout training. The heat and my elevated heart rate were a real appetite suppressant, so I decided to use the fruitcake provided at the next and remaining checkpoints along with my gels. At mile 10 the route headed offroad again (Thornby) and I over the next 4 miles I only saw and overtook two female runners. At 14 miles I noticed a couple of runners had missed a turn heading out of a village (West Haddon) so called them back. I was ready for some company at this point and chatted until we reached the 16 mile aid station. This was quite busy with 15 or so runners refueling as it was the only one to offer savoury snacks. I ate two small sausage rolls, another slice of delicious homemade fruit cake, and topped up with water before a group of us set off together, running silently for a few miles. As we inevitably started to spread out, the runners in the lead missed a tricky turning and again I called them back – I had done exactly the same thing in training! Through the next village (Long Buckby) and it was back on road for a few miles until we reached Althorp and the next checkpoint at 23 miles. I had been looking forward to this one as it was on a stretch of smooth road and was another chance to run barefoot. I only managed about 1.5 miles though as my quads had started to cramp. I was worried I wouldn’t be able to get my shoes back on if I went too much further! I’ve never experienced cramping in a race before, and suspect it was due to the temperature, but found a short walk break stopped it before it became too intense. I was also starting to feel tired at this point, but it was a gradual decline rather than the sudden ‘wall’ I had experienced in the last marathon. At around 26 miles I realised I didn’t feel any more tired than I did an hour ago, and I became more confident of a happy race. I was always 99% sure I would finish, but didn’t know what state I would be in! The runners around me were becoming familiar. We had similar average paces, but ran at different speeds on the varying terrain and gradients. It was possible to start a conversation, pause it for a mile or two, and continue when we crossed again. Very weird! One highlight was chatting to a previous Western States 100 runner, who was running this race for the third time. He had also run over 130 ultras and had broke a metatarsal trying fivefingers! When the results were published I recognised his name – I had read Nick Ham’s previous reports on his blog when researching this race. The remaining miles required concentration as I was beginning to tire mentally. Seeing anyone walking on a slight incline now seemed like permission to walk and the minimal attention I was paying to my pace showed it was slipping. The two big hills sandwhiching the final checkpoint around the 29 mile mark required extended walk breaks, but were a good chance to get it together mentally for the final push. Closer to the end we could also see the pub opposite Lamport Hall high up in the distance, which brought the conversation round to cold beer! That was all that was required for a strong and quite emotional push to the bottom of the final hill. This last uphill walk gave me a chance to compose myself for the final run over the hall grounds and across the finish. I was cramping like crazy but just about managed a smile and victorious arm raise! Leaning forward to receive my medal brought on instant dry heaving, but crippling leg cramps soon distracted me from actually throwing anything up! Walking around stopped any further spasms, as did clapping in and shaking hands with the next few runners I had been alongside for the last few hours. So the race plan didn’t quite pan out as I had envisaged. I had worked especially hard on nutrition, which had meant running two difficult marathons on fig rolls and dried apricots. But I think my body used the five gels conservatively as a result. I felt no sudden drop in energy and think the adrenaline of completing my first ultra boosted my energy towards the end. The cramping was an unwelcome surprise. I experienced intermittant calf twinges towards the end, which took some concentration to relax out whilst running. I also felt my left foot fail to dorsiflex a few times too, but the worst could be walked off. The nausea stayed with me and I couldn’t face eating until late in the evening. With 3800 calories used during the race I thought I would be ravenous, but that hunger never arrived. Out of 116 runners, I placed 43rd in a time of 6:17:19 which I am ecstatic about. Five runners DNF’d and a further 37 failed to start. My garmin recorded a ‘moving’ time of 6:05 but to be honest I am just pleased I made it to the start line injury free, crossed the finish line, and remained injury free inbetween. I’m also pleased to have run about 4 miles barefoot. Not as far as I’d hoped but better than nothing! 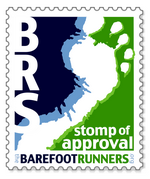 It helped start up a few conversations later in the race, and got a tiny bit off awareness for barefooting! I also wore my Barefoot Britain / Brighton race T-Shirt, but with my race number (1 as in number 1 not 1st, as I kept telling spectators!) covering the front, only those few runners behind me could appreciate it! So……exactly four weeks after running my second ever marathon I was running another – This time the Rotary Shakespeare Marathon! When originally entering this I felt four weeks was ample time to recover physically, and in fact suffered no post race aches or stiffness at all after the first one. I even ventured out with my running club for an interval session two days later. With the ultimate goal of an ultra marathon, I was worried about maintaining my weekly long runs though, with a double taper and double recovery, but they went like this: 13 / 26 / 15 / 20 / 13 / 26 / 13 so no issues there. I had been eating fig rolls and dried apricots up until mile 18, but had my first of two gels here as could feel my energy start to decline. The last 4 miles felt like really hard work but my pace only dropped by about 10 seconds a mile and I overtook a lot of plodders and walkers. I was overtaken early on by a runner who said he liked my shoes (vibram five finger bikilas) and it wasn’t until he was a few metres ahead I noticed he was wearing the same! I decided not to catch him up as he was slowly pulling away. However, I saw him at the finish and we had a quick chat. Turns out it was his first marathon and he finished 70 seconds ahead of me. I did see someone doubled up at the side of the road wearing vivobarefoot evo’s so not sure he finished. I had no issues with my shoes at all, dispite them being very worn after 1250 miles. I reinforced the thinnest parts with bike tube repair patches, which were still present afterwards. The bodyglide and glass lens cleaning cloth covering the rough areas on the inside completely eliminated any rubbing. I did have a few issues with my UltrAspire hydration belt though. On the last few training runs the belt had jumped around a lot when the bottle was full, but settled once there was some air space in it. It just didn’t settle down at all during the marathon and at one point fell off completely with all the adjusting! Luckily I caught it as it fell. Since then I have realised that although my weight has stayed constant throughout training, my waist has gotten slightly smaller. Coupled with thinner clothing now it has finally started to warm up, the belt on the smallest adjustment isn’t tight enough. I have sewn a double fold in the outer fabric to reduce the fit by about 2 inches and since then it’s been spot on. Running at a lower effort level. And hopefully running the ultra course as it’s local. I first heard about strava last year but assumed it would have little significance to me in little ol’ Markat Harborough due to the USA user bias. So when it appeared on my radar again recently (for the wrong reasons) I decided to register and see if there was any local activity. After a quick and painless registration, a search revealed quite a few road cyclists in the area who were regularly logging sessions. There were also a couple of local runners who ran regularly on the same routes I used – great! So I uploaded a few of my most recent runs using the garmin gpx files, and I was awarded a few personal achievements for my trouble. I then wondered about importing my garmin history in to strava, and maybe claim a few of those course records. There isn’t an easy strava side way to to this en masse, but I found a website claiming to do just that, as well as copying in any fresh data from garmin connect. After setting up this process, my 3 odd years of moutain biking and running had appeared overnight – wow! This indeed landed me a few Course Records (CR) or King of the Mountains (KOM) for cycling activities, and also refreshed my personal achievements, although some of these are off due to GPS reception issues. It is also very easy to create a new ‘segment’ using the gps map of a previous run, and then others can attempt to beat it. Now when I get in from a run my data is uploaded to garmin connect and all I have to do is make it public for it to show up in strava. After a few minutes I can see if I beat any previous distance or segment records. Strava also have a phone app which will record activities directly and I believe gives a warning when approaching a segment, but I haven’t really tested the app yet. I haven’t looked too much into the controversy regarding strava – I didn’t want to form any opinions before trying it for myself. What I do know is training is more fun with others and it can bring out the more competitive aspect. If that happens in a time shifted, virtual environment then so be it. Once all this long distance training malarky is out of the way I’m looking forward to attempting a few local segments to see if I can grab me some CRs! I intend to run my first ultra marathon at the beginning of June this year, a 35 miler. I couldn’t get my head around training for 35 miles, so planned a couple of ‘training run’ marathons leading up to the A race; this being the first. The Northampton Running Festival stages a 10K, half and full marathon distances over a multi-lap off road course on the grounds of Delapre Abbey. It was organised by GoBeyond, who also hold the ultra in June. On this fosty morning the 10k runners set off first for their 3 laps, the halfers followed 5 minutes later for 6 laps and lastly the marathoners. This starting format worked fairly well as the faster runners were well ahead by the time we conservative pacers started. The course was modified in the final week due to flooding caused by the earlier nationwide snow storms. The original route circumnavigated the lake for a large portion of each loop, which would have meant a flatter, more consistant course. The modified route was more compact and twisty with four inclines, a couple of drops and a much more varied terrain, all multiplied by 12. Not that I’m complaining; dozens of races were cancelled the weekend before and so I was just happy this one went ahead at all! I ran in my vivobarefoot breathos (2.mm sole and 4.5mm lugs) and they were the definitely the right shoe for me on the day. As the first few laps went by, I noticed my mile splits forming a pattern: alternating roughly between 8:35 and 8:45 mins / mile. This was due to the lay of the course for a similar level of effort. I had intended to run at 8:45 for first half and then try to pick up the pace depending on how I felt, so timing would sort itself out if I continued with these alternating splits. As a long training run I didn’t have any real expections for a finishing time, which took any pressure off when my pace began to slow. Compared to my first marathon last year this one didn’t go to plan, and was a timely reminder that running long distances isn’t easy and not to get complacent. I had visions of running a extra lap at one point! Speaking of which, I passed one finisher (100 marathon club member) running in the opposite direction after finishing. He might have been joining a friend, or possibly making up the full 26.2 distance – I had read a blog where last year’s course was short, and intended to run the extra myself. But after crossing the finish line I didn’t have the energy or willpower to run the extra 0.75 miles my garmin indicated. Inspecting the downloaded garmin data, I think a lot of this was due to the 24 turns over 12 laps and the general GPS accuracy, so I’m not going to beat my self up over it! Adjust pace for terrain type and conditions. I have also been impressed by my recovery, with no aches or stiffness, just one foot cramping up the day after. I ran 4 miles (club interval session) two days after the marathon, 6 miles midweek and a decent 15 miler seven days later. The next marathon is 4 weeks after this one, then only five weeks to the Big One! I recently semi-retired my first pair of fivefinger bikilas after 1200 miles of faithful service. A couple of DIY repairs to the thinnest part of the soles with bike inner tube patches had extended their life by a few hundred miles. But there were areas on the inside that had become rough and were causing blisters on longer runs. After treating myself to a shiny new pair of fivefinger seeya’s, I experienced rubbing on the inside of my feet from the first few steps. Unfortunately this didn’t dissapear once the shoes had been worn in. I think the rubbing is caused where the stretchy upper fabric meets the relatively secure strap. The solution I came up with was to place a glasses cleaning cloth over the area in question. I used this as the material is very thin but has a high weave density. It’s strong but doesn’t cause any friction. The first real test was a 15 mile run at 8 minute miles. The foot with the cloth was fine (hooray! ), but the other (which hadn’t actually caused any problems to date) had rubbed to the point of drawing blood (boo!). I just need to secure cloth permanently to both shoes with a few stitches. So what to do with my poor feet? The constant rubbing had left darker patches of skin once the blisters had healed. I remembered reading that vitamin E was effective for healing scars, but rather than use cream I purchased some high concentration vitamin E capsules. I pierce them and apply the content locally. One capsule lasts about three days, applying twice daily. There has definitely been some improvement over the weeks, with the old vivobarefoot base of big toe war wounds almost gone. I’ve also noticed any fresh damage healing more quickly than before! Sometimes on a run we make a bad decision….”of course I can overtake that runner in front”, or “shall I just just have a quick explore down that track”, or even “that probably isn’t really a bull in that field.” Usually they cost us a breathless few minutes, a telling off from your better half for getting back late with muddy shoes, or a surprise sprint out of the bull’s field. At the start of December I made my worst decision (so far) when out for a run. It cost me a day’s work through not being able to walk, two visits to the doctors, a fortnight of no running, and worrying my family. And I think I got off lightly! I walked the dog as usual before my Sunday long run, and thought “wow, it’s really cold and frosty. If I run barefoot today I must be really careful.” The reason I was even contemplating any barefoot miles was to hit my final goal for 2012 – 500 barefoot miles. I was currently at 443 miles so my goal was just about achievable. Within the first quarter mile I ran over a few patches of thick, crunchy ground frost with slight discomfort. But once the blood got properly circulating my feet warmed up and I settled in to the run. At mile 7 I felt a new sensation at the back of my heels; almost like coming out of a numb state. I stopped and checked my feet but they looked and felt fine. Another 1.5 miles over really hard frost and I was back in town and a mile from home. However, this was a 13 point something mile run so I carried on for another half loop. At 10 miles I made the decision to carry on barefoot, rather than slip on the xero shoes I was carrying. I wanted those 3 barefoot miles to add to my goal. Bad move Bob!! Most of the frost had melted by now so I was also running on very wet roads, although towards the end I began to feel cold, but I put it down to the wind. At exactly 13 miles I reached a patch that had been dried by the winter sun, and within seconds I could feel something wasn’t right. Something felt vague, almost mushy. I stopped and found large blisters on the balls of both feet. Bugger! At his point they were only partially filled with clear fluid. I popped on the xeros and ran a quarter mile, before having to walk the last quarter mile home. The last few hundred metres became progressively painful, and when I got home the blisters had become fuller and had turned pink. My partner insisted I saw the out of hours nurse, who diagnosed frostbite. I had antiseptic pads and bandages applied, and she advised not to pop the blisters so as to maintain a sterile environment for the skin to heal. The blisters had filled with blood now, which indicated damage to the blood vessels underneath. I could hobble around for the remainder of the day, but when I woke up the next morning the blisters were so full I couldn’t put any pressure on them, making walking too painful. After a day off work with my feet elevated, walking was bearable using the outer edge of my feet. My partner wanted me to see the doctor for a checkup, and this was a good call as he put me on antibiotics due to the redness and temperature around the right blister, indicating a possible infection. Another few of days shuffling around, and the fluid in the blisters started to become absorbed, until slightly over a week later there was just dried blood under my thick skin. Things stayed like this for three weeks until the Christmas holidays, when I ran off road almost every day. Due to the flooding, my shoes and feet were sodden for hours at a time which softened the skin allowing it to peel away. The new skin looked very healthy and pink, but is was baby soft! When I did my first barefoot run almost four weeks later, the rest of the skin on my forefoot also started to come away, so it had been damaged by the cold too. I took a series of photos and video clip over the initial days and final weeks of the healing process. So as not to offend any the casual browsing folk they can be viewed by clicking here or on the top photo. So although I had made a mental note to be careful before my run, I completely ignored this and ran for almost 2 hours over frosty surfaces. I should have been checking my soles regularly. The very last point at which I should have stopped barefooting was when I started to feel cold, as that is when my core temperature dropped and the blood supply to my feet wasn’t adequate enough to prevent frostbite. Happily, my feet suffered no long term damage and I only lost a couple of weeks running (and that was being safe). However, a lesson was well and truly learnt! Joining the local running club also meant automatically registering with UK Athletics and RunBritain. UK Athletics is the governing body for the sport of athletics in the United Kingdom and RunBritain oversees road race organisation. In 2010, RunBritain launched a handicap scoring system for road runners where each race entered, from a 5K to a marathon, is awarded points depending on the race time, course difficulty and conditions on the day. Usually the results are compiled automatically soon after the race. The points are displayed on a graph over time, so a registered runner can see how they are progressing. Other features include how a predicted time will effect your rating, and your national ranking. Although I wasn’t ‘racing’ my time was captured and had a negative affect on my ranking. My next race was a barefoot half in October, and then the week after that I PB’d in another half. I was obviously happy to PB, but (you guessed it!) was also happy to find myself at the top of the list for October’s most improved road runner. First prize was an Adidas miCoach training thingy, and second onwards was a pair of Sennheiser sports headphones. As I already have a garmin GPS / HRM watch I decided if I won I would donate the miCoach widget to my running club. My first position remained unchanged until the final week, when I was overtaken and dropped to second place. Boo! I used the handicap predictor, and if I entered the nearest parkrun and ran a 20 minute 5K, I would gain another 1.6 points easily returning me to first place. Unfortunately we were travelling on the final Saturday and there was no way I could fit in a race. And sure enough a nice pair of sports headphones arrived a couple of weeks later. I’m sure I will put these to good use on those long offroad runs! The Bupa Great Birmingham Run was my second half marathon race in two weeks, and one I really wanted to set a new PB in. My exertion induced headaches meant I hadn’t done any race specific training so would be running on my base fitness. Since my 1:41 hr current PB last year in the Leicester Half, I had joined my local running club and run a marathon so I knew I was in better shape. Then again the previous weeks barefoot half had taken more out of me than I thought, but I ran it a lot quicker than I planned too! I managed to get a very good place a few metres from the start of the first wave, but as I passed over the chip mat, someone clipped the back of my trusty vibram and my heel popped out. It was a bad start after all! I ran on for fifty or so metres, glancing behind me looking for a safe place to stop. That was the moment when a camera caught me, broadcasting live on national TV! Once I had sorted out the shoe issues, I settled into a steady pace until just under half way. The out and back stretch along the Pershore Road meant we passed the lead and faster runners (or rather they passed me! ), including the overall winner Micah Kogo. On the return stretch I was feeling strong so pushed the pace a little, the live bands every mile helping distract me. I knew there was a 1.5 mile uphill section around mile 11 so kept a bit back. When it arrived it continued around several sharp turns making it really hard to judge. The final straight had massive crowd support which helped with a strong finish. My partner and daughters were just over the finish line so it was great to see them. My final time was 1:35:55 hrs – a solid PB! Sadly a runner collapsed and died after crossing the finishing line. Kevin was 36, a regular runner and had trained for the race. RIP Kevin. A couple of weeks later I recognised the name of the race winner, Micah Kogo in the book I am reading “Running with the Kenyans” by Adharanand Finn.